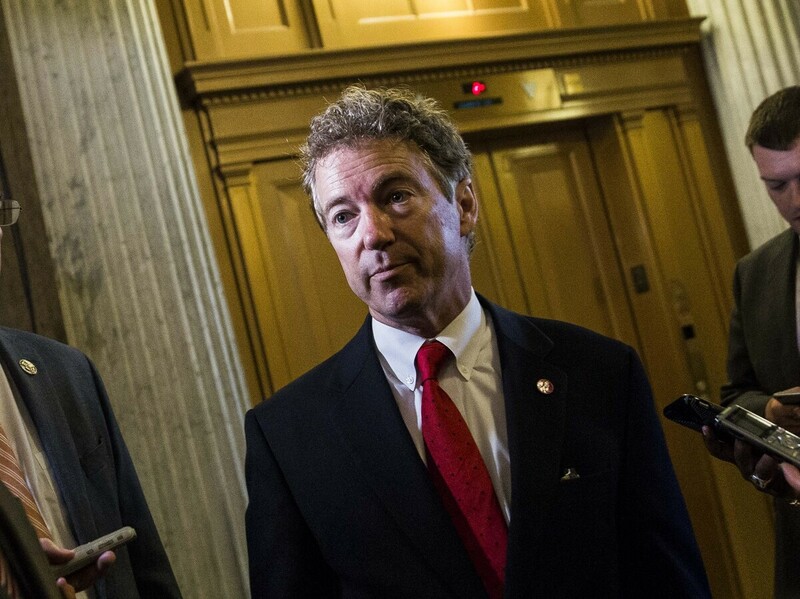 Americans Say They Want The Patriot Act Renewed ... But Do They, Really? : It's All Politics A new poll says Americans want NSA data collection renewed. Yet another recent survey says Americans want better controls on what kind of data the government can collect. What's going on? Sen. Rand Paul, R-Ky., speaks to reporters on May 31 after leaving the Senate floor, where he spoke about surveillance legislation. Fully 61 percent of Americans said they approve of renewing the Patriot Act's provisions to allow for continued collection of phone data, according to a CNN/ORC poll released Monday, which had a margin of error of plus or minus 3 percentage points. But, just months ago, a Pew Research Center survey showed that two-thirds of Americans said they believed there aren't "adequate limits" on the kinds of phone and Internet data the government can collect from them. That survey had a margin of error of plus or minus 5.6 percentage points. What's going on? It's impossible to know why these particular polls came out showing conflicting attitudes, but we do know that survey respondents' views on government surveillance can swing widely depending on how the question is asked. Pew studied this in 2013, when it asked the question a number of different ways. When Pew mentioned terrorism, people were significantly more likely to support government collection of data than not. In addition, political scientists in a 2007 study asked people whether they supported or opposed the Patriot Act, but they described the act differently in each question. In one, they were vague, saying the Patriot Act makes it easier for the government to collect information on Americans. In others, the surveyors explained how the act allows for searches of homes, as well as library and hospital records. Respondents were far less likely to support the law when those provisions were described. That provides a new lens through which to look at these sorts of surveys. It's possible that when asked about a specific law that was created to thwart terrorism, people felt more supportive, but that they also generally support the idea of less government intrusion into their lives. So even while many Americans may worry about their privacy, these sorts of experiments also show how much tension there is between security and privacy for Americans. It's difficult to weigh one against the other when you want both. One thing that is known is that these views vary by age. The CNN poll found that only half of people ages 18 to 34 believe Congress should renew the NSA's ability to collect phone data. But as one goes up the age spectrum, approval of Patriot Act renewal also climbs — 71 percent of people over 65 approve of renewing the act. Lots of factors could be at work here — millennials grew up online, for example, and may feel more acutely how much of their information is out there to be gathered. Many of them also were quite young when Sept. 11 happened; when the events that precipitated the Patriot Act are barely memorable, it might make renewing it seem less pressing.